Sorry for all the rush rush posts, but life has been crazy busy for me, between doctor appointments and hair appointments, I just don’t seem to have so much time. I’m hoping that things settle down after my trip to Vegas next week! Woohoo! Yup I’m going to Vegas! It’s little Jenny’s 21st birthday and when she was 11 I told her when she turns 21 I’d take her to Vegas, and guess what? She remembers that. I always keep my promise, so it will just be her and I hitting the Las Vegas Strip. Ohhh, it’s going to be fun! But for fun right now I have a light, tropical quinoa salad for you. I made this Sunday when I made my weekly batch of quinoa. I originally was planning to make it with Mango Salsa, but my mango went bad! That is so sad when I waste food, so what is a girl to do? Grab some pineapple and use that instead! This dish is simply wonderful! As I said before it’s a nice light tropical dish that is sure to brighten your day! 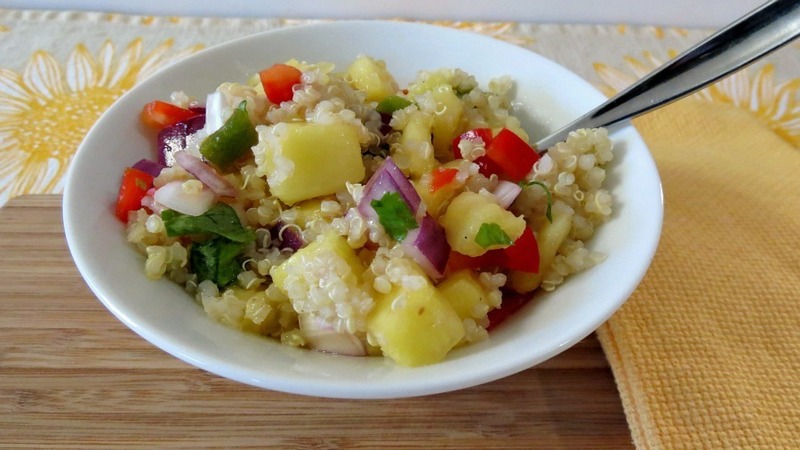 It’s made with basic quinoa, then I added my pineapple salsa. The salsa is so sweet with a kick of heat from the jalapeno and onion. Yum! It also has some sweet bell pepper and orange and lime juice. It’s simply a perfect salsa that is also great on chicken or dipping into chips!! I love my salsa!! If your planning on eating it all in a sitting, not by yourself of course, then mix it all together. But if your like me, who is having this in your lunch, leave the salsa and quinoa separate and mix it when your ready to use, otherwise it make get soggy and no one wants soggy quinoa!! Yucky! 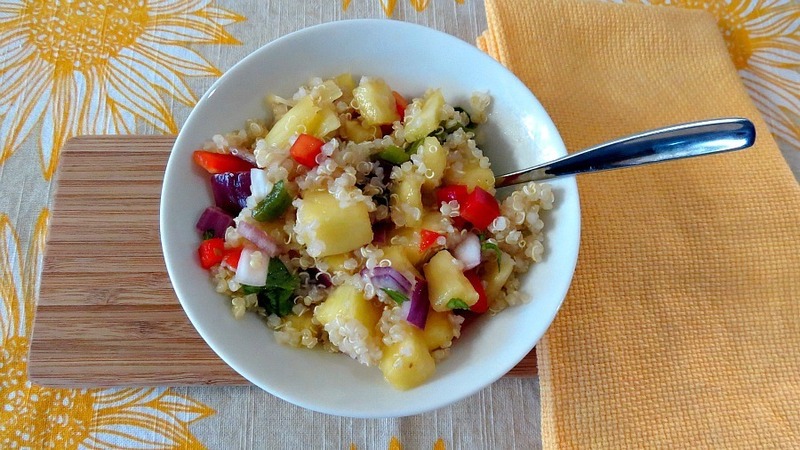 A light tropical quinoa salad made with fresh pineapple, jalapenos, onion and sweet orange juice. Place quinoa in a pot and add 2 cups water. Bring to a boil, cover and simmer for 10 - 15 minutes, stirring occasionally. Cook until all the water in evaporated. Meanwhile In a bowl, add all of the pineapple salsa ingredients; carefully mix. Refrigerate to chill. Use up within 3 days. 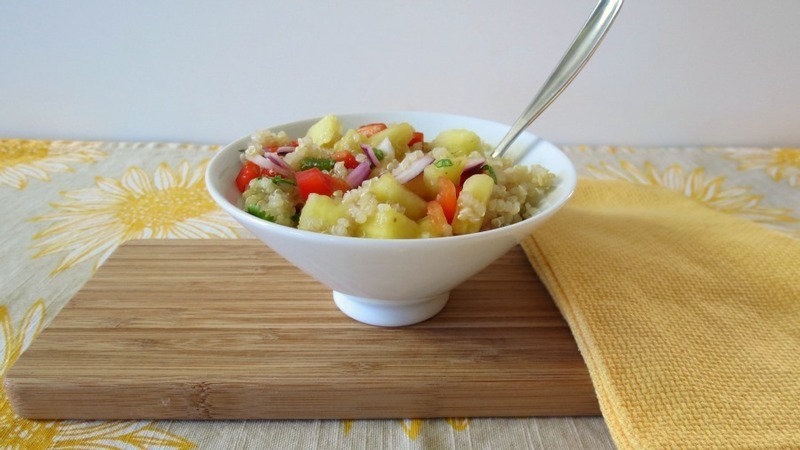 When ready to use, mix cooked quinoa with pineapple salsa when ready to serve. 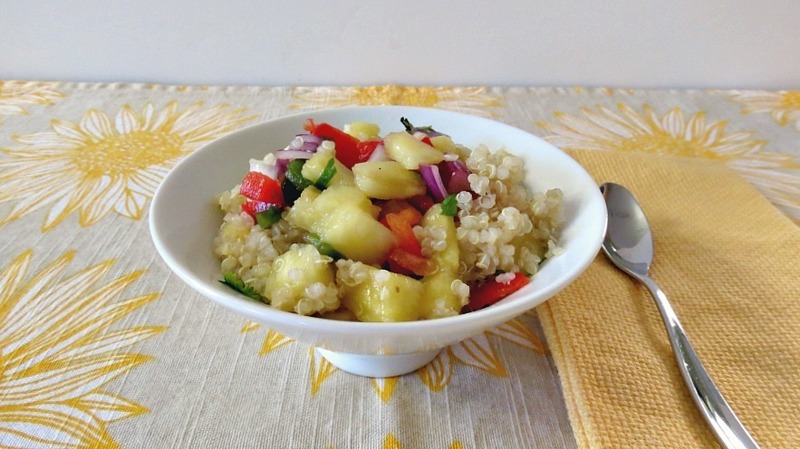 What a fun way to kick up quinoa! Have fun in Vegas…it’s been far too long since I’ve gone. 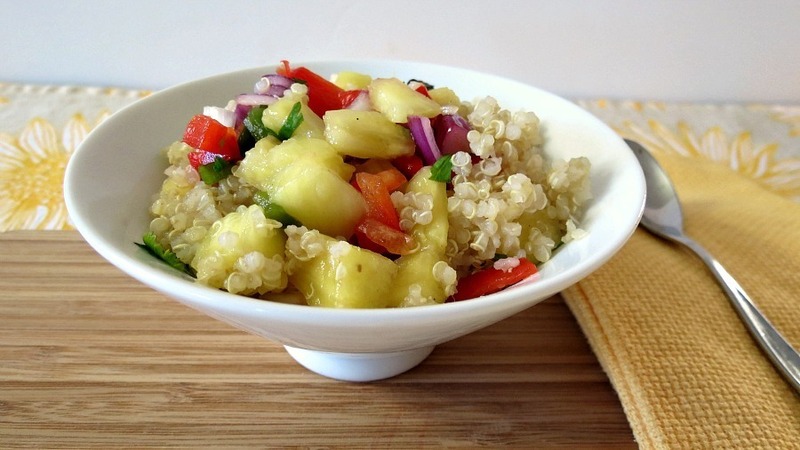 What a great way to cook and eat quinoa! I’ve been trying to find new ways to eat it. Thanks for sharing. Your welcome!! It’s so versatile it really goes with almost anything! I’m loving quinoa right now! This sounds super tasty! For some reason, I’ve only REALLY liked quinoa when there’s something a little sweet with it. I like it with some sweet too! I am really loving quinoa lately and it really picks up the taste with whatever you cook with it! Looks yummy! Never would have thought to put quinoa in salsa! My 21st is in two weeks and I’m going to NYC a few days after! Have fun with little Jenny! Happy Early Birthday!!! NYC is going to be so much fun! Enjoy your special day!! You make quinoa look so good!! Love how you have pineapple in your salsa, delicious choice! Aww how sweet of you to take Little Jenny to Vegas for her 21st! you’re the best! As is this salsa. It’s full of so many fun tropical flavors! I know I can’t wait for Vegas this week! I need a vacation, but how relaxing is Vegas?